Consigning with Munchkin Market is Easy! A Munchkin Market favorite is checks are ready Sunday at pickup. If there is some unforeseen problem checks will be mailed within 7-10 business days. Your non-refundable registration fee must be paid upfront through Paypal. When registering you will be sent to Paypal to pay with your Paypal account or a credit card. You must follow all the directions carefully to ensure your registration. After payment you will be prompted to Return to Munchkin Market registration website by a click of a button. If you do not do this step your registration will not be complete. Please email us with any questions. You will get a receipt from paypal and an email from us with your consignor number. If you do not get email from us with your number then you are not signed up. Also, if your paypal account is under a different name then the name you are registering under please type consignor name under the notes in paypal. Thanks! Please bring no more than 150 children’s hanging items and no more than 75 children’s non-hanging items such as toys and baby items. Only eight pair of shoes in like NEW condition. If you have special request to sell more please email us before the sale. Holiday Wear: Easter, Valentine, Mardi Gras, 4th of July or any spring/summer themed dresses and outfits etc. Toys in like new condition (must have all pieces & working batteries if applicable) Make sure all pieces are attached to main part of toy. Puzzles (board puzzles that we can see that all pieces – wrap saran wrap over it or put in large ziplock bag to tag puzzles). Any clothing items that are out of date, stained, heavily worn, missing buttons, broken zippers, etc. Car seats (unless with a travel system). We will take booster seats that use a car seatbelt. **Please check your items for stains in a well lit room. We can’t put out items with stains on them without letting the shoppers aware of any stains. Items with any stains will be marked “stained” and may or may not be put out onto the sales floor. After checking these list of acceptable and unacceptable items please email us if you have a question! Any items from the above list brought in to consign will immediately be donated. Our tagging procedure is an online tagging system. Using this computer system makes tagging more efficient and a way to track your sales during the week. You will still get PAID fast just like before. Option #1 - Online Computer Tags & Print Your Tags at Home! CONSIGNORS must use computer tagging online system to tag items. Please email us if there is a reason this will not work for you. Let us know if you have questions. Once you are registered click on the link and enter your username and password. Click WORK WITH MY CONSIGNED ITEMS (ACTIVE INVENTORY) to begin inputting your items. Before you begin inputting it goes faster if you have you clothes by size and gender. Then click if you wish to discount this item and/or donate this item. Click SUBMIT and keep going! Once your tags are printed attach them to your items using a safety pin on the left side of item (Think over the heart). Bring your items to sell on drop off days! Don’t forget to get an appointment to make things faster at drop off. 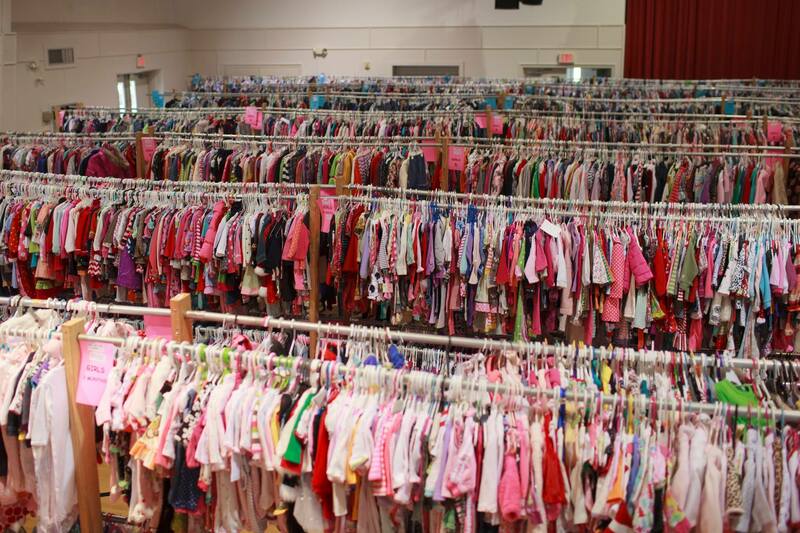 Maximum of 150 hanging items gently used clothing from newborn to juniors. All clothing must be hung on a hanger (going in direction of ?) and a safety pin must be used to attach clothing to hanger and attach tag. Please make sure there are no holes, stains, or outdated clothing. Please only bring clothing for the correct season. Maximum of 8 pair only and we have to be strict about this policy. Please bring shoes that are new or like new. Shoes must be tied together with ribbon or zip ties. We can not sell shoes that are not tied together in some way. To tag shoes make a card just like you would for clothing. Punch a hole in the card and tie the shoes together with a ribbon. You may want to mark each shoe with your consignor number using a piece of masking tape. If you still have the box that the shoes came in you can bring them in the box but still have the shoes tied together. No more than 8 pair of shoes per consignor please. Please make sure toys are in excellent working condition with all parts and batteries. If there are loose pieces either tape them onto toy or put in large ziplock bag. Loose items will get lost and will not sell. Please double tag any large toys that are too bulky for a shoppers to carry around. Please no more than 75 items that are not clothes such as toy and baby items. Please make sure swings, strollers, high chairs, bouncers, etc. are cleaned and with working batteries as needed. Maximum of 5 purses, wallets, totes, travel bags, and gently used luggage. Please make sure to check all pockets. When shopping for big ticket item stay with the item you want and get a volunteer’s attention. Do not leave that item without seeing a sold ticket being put on it or someone else may try to get it. The volunteer will then tag it sold and bring it to a holding room with your name on it. At check-out you will tell someone you have something being held and they will go get it for you at checkout. We will have a volunteer at the front to go get shoppers items once they bring ticket to checkout. We think this system will eliminate any confusion. Please tag your electronics so we can keep them as safe as possible by closing game in ziplock bags. When shoppers want to buy an electronic they will have to place electronic in holding room then a volunteer will go get it for them when checking out. This is a quality consignment sale so please bring your very best items in the best condition. Items need to be priced accordingly. The neater your tags are made and clothes prepared means more money for you! No items under $3.00 will be accepted to keep the quality of items high. For example: If you have three newborn gowns put three gowns together and price it $3.00. Or put 3 puzzles together in a bundle and price it $3.00. Prices should be around 1/3 of regular retail. If items are not in excellent condition you may want to consider reducing them a little further. Outfits and sets tend to sell better rather than just a shirt or just a pair of pants. We encourage you to price your items to sell 1/2 price on the last two days of sale. Do you really want to bring it home now that you have cleaned out? To price your items to sell 1/2 price write your entire tag in RED ink or be sure to click DISCOUNT YES on computer tags. Also, if you donate ALL your unsold items then you will get an extra consignor ticket for 5:00 Monday to give to a friend to shop with you. To get this perk your must donate by putting a STAR on the bottom left hand side of tag or if computer tagging then click on the donating hand on your tags. If computer tagging a suggestion would be to circle DISCOUNT YES in a red pen so it will stand out more as 1/2 price on Friday and Saturday. It is our goal to provide shoppers with quality items. Please inspect your items carefully before bringing them to drop off. To maintain the quality of our sale, we will enforce very strict guidelines. Think price to sell! What would you pay for it? We will be glad to help you price your items if you have questions about pricing email us! Don’t get overwhelmed ~ it’s easy!